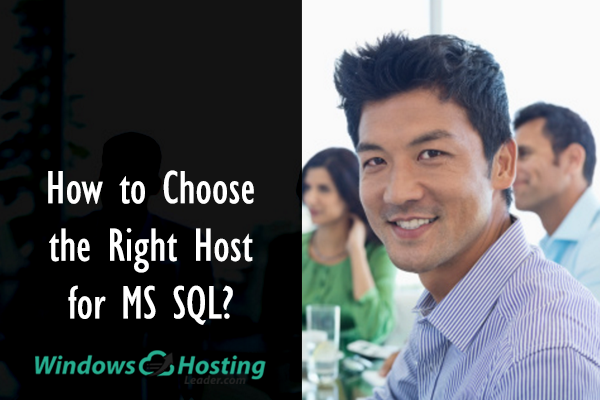 How to Choose the Right Host for MS SQL? Comments Off on How to Choose the Right Host for MS SQL? As is known to all, MS SQL hosting requires Windows server platform when people choose it to create websites. However, it causes that MS SQL hosting price is much higher than the price of MySQL hosting that can build on the Linux servers. That’s why many people have to give up expensive MS SQL hosting. Most hosts do not support MS SQL. In a sense, this makes finding a host easier because there aren’t as many of them. But you still want to get the best host for your purposes. This is what this article is for: to help you choose the right host. MS SQL is Microsoft’s database management application, built using the Structured Query Language (SQL). This versatile, powerful application enables you to create, manage and access databases on both local and remote machines to serve multimedia content, organize customer information, and create personalized content for visitors to your site. Whether your hosting provider offers Linux-based or Windows-driven servers, chances are you’re going to need access to a database management program built around the Structured Query Language (SQL). Creating and managing databases is an essential part of many Web applications, including e-commerce, interactive games, and content management systems (CMS) like WordPress. SQL isn’t generally a primary factor in choosing a host, but it can be an important factor in the specific plan you select. For Windows-driven servers, the most popular SQL solution is MS SQL (also known as “SQL Server”), Microsoft’s proprietary database management application. Designed and optimized to work seamlessly with the company’s .NET framework and ASP.NET (in this context, “ASP” stands for Active Server Pages, Microsoft’s script engine for designing dynamic Web content), MS SQL is a key part of application development for Windows environments. It also boasts very high compatibility with Web 2.0 solutions from industry leaders like HP, Dell, and SAP. And like other SQL applications, MS SQL also provides enhanced security for databases; an important feature when you are transporting sensitive data like customer credit card numbers or activation codes. Unlike open-source solutions, MS SQL is backed by the extensive Microsoft support system, and its power and standardization have made it a leader in enterprise-level database management and application development. Whether you’re building a blog or supporting a fully-featured online storefront, if your site and staff require support for Windows and Windows-based applications, MS SQL may be your best bet. One caveat: the software is not free, and may require the purchase of a license, although many providers include both support and licensing for MS SQL in their Windows hosting plans. Add in the fact that Windows hosting remains slightly more expensive than Linux-based hosting, and you could find yourself paying moderately more than you would for a comparable level of hosting on a Linux server. Double-check with your host for full details. Microsoft SQL Server (MS SQL) is likely the database you’ll use if you choose Windows web hosting. MS SQL uses the same Structured Query Language (SQL) that alternative solutions, such as MySQL, also use. Switching between the two is simple providing you have a reasonable command of Windows server management. How is MS SQL Used? Microsoft SQL Server has been in development since 1989 when it was released for the OS/2 operating system. OS/2 was developed by IBM and Microsoft in tandem at first, and IBM eventually took it over. Later, Microsoft purchased the SQL Server solution from Sybase and continued to develop it for its own product family, starting from Windows NT onwards. SQL Server has been continually evolving for almost a decade. The 2005 version of SQL Server was notable for supporting eXtensible Markup Language (XML) and Common Language Runtime (CLR), allowing MS SQL Server to integrate with Microsoft’s .NET framework and greatly expanding its potential audience. The 2005 version also included SQL Server Management Studio, a graphical tool which made management much easier. Media support was added in the 2008 release, and this was critical for its use on the web. MS SQL exists in several versions concurrently, so it is never automatically phased out when a new iteration is released. MS SQL can therefore be installed on single-user computers, dedicated servers or entire datacenters, since there is a version suitable for most purposes. The Enterprise edition of SQL Server 2017 is designed to support massive organizations and can handle database sizes up to 524 petabytes (549,453,824 gigabytes), utilizing all available server memory and physical processors. SQL Server 2017 is the first version that officially works under Linux. It can run in Docker containers, allowing its use in self-contained, containerized installations. A “container” is similar to a virtual machine but more lightweight. All versions use the same code base, so there should be few compatibility problems between operating systems. SQL Servers 2016 and 2017 add numerous security features. SQL Server Express is a limited version that’s available for free. Microsoft doesn’t license it for shared hosting, but it can work with dedicated or virtual private servers that have limited database requirements. It’s often embedded into applications. It’s not a good choice when multiple processes need to access the database. The Microsoft Access database is strictly for desktop use, and you aren’t likely to find it on a hosting service. Although MSSQL hosting is expensive, there still are cheap MSSQL hosting solutions in the industry. They provide users with rich features, great performance, award-winning supports as well as the cheap price. And through our research, we find that ASPHostPortal is the best cheap MS SQL hosting provider you can find in the industry. One of the best Windows Hosting in United States is ASPHostPortal.com. This provider was founded in 2008 and provides Windows-based ASP.NET web hosting services. This company currently supports Windows Server 2012 hosting with all version of ASP.NET, Visual Studio 2012, WebSockets, IIS 8.5 and support the latest Microsoft technology. ASPHostPortal MS SQL hosting is really cheap, even cheaper than lots of MySQL hosting solutions. In regular time, ASPHostPortal MS SQL hosting starts at $4.49 per month. Now, ASPHostPortal launches a promotion campaign and cuts the price 15% off. Therefore, $3.81/mo is set at the final starting price of ASPHostPortal MS SQL hosting. Are ASPHostPortal.com Best and Trustworthy for Your MS SQL Hosting Provider? I like how ASPHostPortal.com allows you to prepay in 3-month installments so that you can try the service with little risk and see if it is right for you. Even then, you’ll have access to a 30-day money back guarantee if you don’t like the service and choose to cancel within the first 30 days. The company sports an uptime rating of 99% over the past decade, and since 2008 has seen less than 10 minutes of downtime which is absolutely incredible. ASPHostPortal.com is one of the few Windows web hosting companies that offers all of its clients the Plesk Panel for Windows as the backend system that clients will log in to. The company is actively working to make their Windows hosting systems as easy as possible to set up and get going. Most of the major content management systems (like WordPress, Drupal, Joomla, and others) are available via a one-click install system, as are a number of other software packages that are relevant to webmasters and online business owners. ASPHostPortal.com provides its windows plan with all of the tools and support needed to have the full-featured business up and running in minutes. You can create unlimited web sites under your own brand name, with their own prices, packages, and features. As a ASPHostPortal.com reseller you will keep 100% of the money you collect! « Is Your Web Hosting Included In The Following List? Should You Move?